That's exactly what I'm feeling for the people of Haiti right now. I feel sorrow, with the desire to somehow help alleviate their suffering. My heart is burdened for the country and its people and all they lost in such a short time. I've been following the story of a fellow blogger who was stuck there visiting the son her family has been trying to adopt for years. Reading about her experiences during and after the earthquake has been heart-wrenching. She's a survivor. I'm praying and signing for her son to get home to his forever family soon. She has finally made it back to the states and will hopefully be home to her husband and other kids soon. But I keep thinking of those who are still there, whose homes and lives have been turned upside down, destroyed. The Haitian people will never be the same. I don't have much else I can say except that I'm praying and I know many of you are praying and giving support already, too. 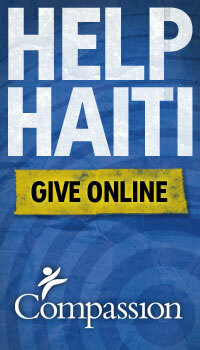 If you haven't found a place to give of your resources yet, one place you can do so with is Compassion International. I feel like, now more than ever, we are a world away from the poverty-stricken Haitians. An easy, comfortable, abundant world away. Money and prayer. That's what we can give from here. HOW DONATIONS WILL BE USED: All funds raised in response to the Haiti earthquake will be used immediately to provide for Compassion-assisted children and families affected by this crisis. Any funds raised in excess will be stewarded by Compassion for additional and future disaster relief efforts. You can provide immediate relief today. • $35 helps provide a relief pack filled with enough food and water to sustain a family for one week. • $70 gift helps care for their needs for two weeks. • $105 helps provide relief packs filled with enough food and water to sustain two families for two weeks. • $210 gift helps care for two families' needs. • $525 helps provide relief packs filled with enough food and water to sustain 10 families for two weeks. • $1,050 gift helps care for 10 families' needs. • $1,500 helps rebuild a home. • $2,100 helps supply 20 families with the basics for three weeks. Due to the high number of responses it may take longer than normal to process your transaction.